We undertook a major update for darkmatter journal. This involved upgrading wordpress software (which is used to run the journal), and installing a new look/theme Mimbo 2. I used a live test site, to enable the other darkmatter editors to check developments, as well as ensuring that the plugins were working nicely. On the day of the live update, we had around 3hrs down-time, when the WP database was upgraded, new theme installed, and extensive checking for dead and missing links. Updating the theme resulted in a fair bit of work – tweaking Mimbo 2 while integrating some of the new features in Mimbo 3. (The updated Mimbo 3 version while having some nifty features, didn’t really work for the journal content presentation, so continued using Mimbo 2). One hack to mimbo I especially liked was adding a tabbed box on the RHS sidebar, now neatly displaying the Menu, Popular Posts & Comments. Mimbo 2 also needed to be slightly hacked in order for it to rotate Featured posts (on page refreshes), while these not being duplicated in other posts on the homepage page. I tried cutting back on the number of plugins, but there are still many being used, especially to enhance the journal and maintain some key features (such as co-authors and footnotes). Also, shifted to using the robust UK universities JISCMAIL for the darkmatter newsletter. Originally, a commercial company – zookoda – was used, which I was never comfortable with. (And I experienced a mini-nightmare retrieving the user database with over 250 subscribers from zookoda as it closed down. Don’t trust the cloud with your data...). Hope you’re pleased with the new look of the journal. 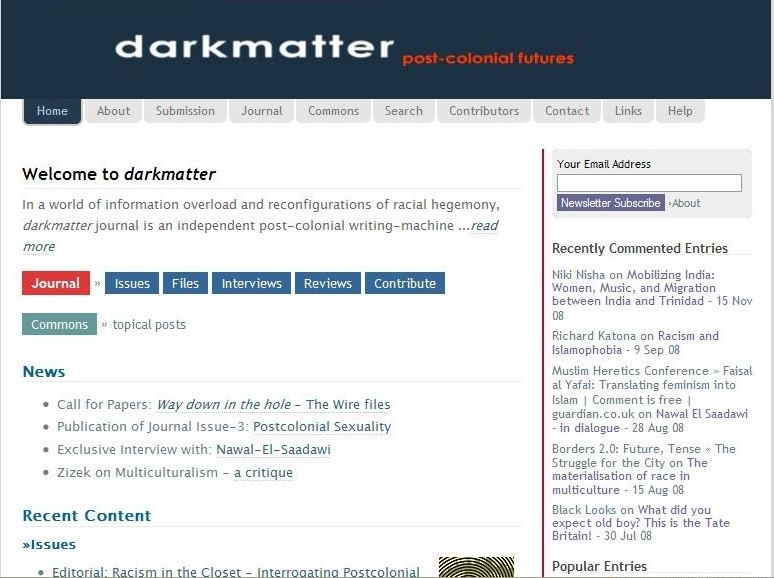 darkmatter while focussed on developing postcolonial critique for the net, is also developed using open-source software and thus, a continuously evolving project . For posterity, here’s a picture of the original darkmatter site.